Today, November 14th, is World Diabetes Day. November is Diabetes Awareness Month. 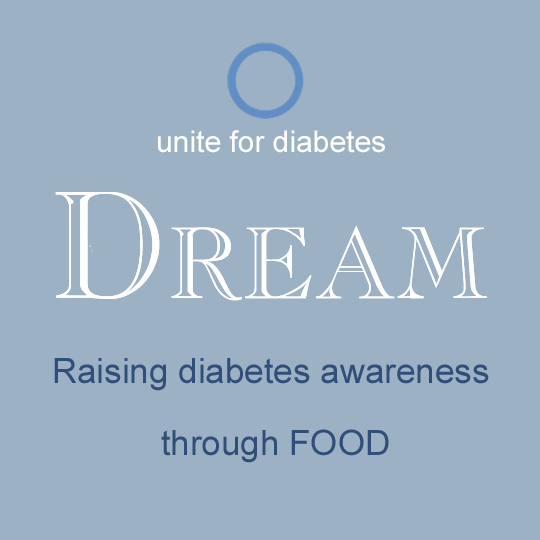 It is a day that we as a collective group of individuals, who support diabetes research and know people who are affected by the disease, to rally together and offer our support and love. Diabetes is a world issue. More and more people, including children, are learning that they have diabetes. We have come a long way in understanding why some people will and do get diabetes. In some cases we can alter our diets and this can improve the situation. I am grateful that I am able to participate along with 40+ other bloggers and share a healthy recipe. Our hostess is Carolyn from All Day I Dream About Food. She has set up a special link party so that all of our recipes can be found in one place. On top of that she is giving away a BLUE KITCHENAID MIXER…so exciting!!! I am not a doctor nor do I have diabetes, this is just my experience with two family members. Growing up, the word diabetes was just that, a word. I don't remember ever hearing phrases like "we need to watch the sugar in our diets" or "we should eat less bad carbs". I never heard the word diabetes until I became an adult. I did not know that certain foods were prohibited and that changes needed to be made or you could get sick. As my grandmother got older she developed issues with diabetes. I watched my grandmother continue to eat or rather sneak treats. She would have things hidden through out her kitchen and bedroom. She was in denial for a long time. She eventually did not have a choice and had to listen to her physicians to make some changes. She was prescribed medication and learned to alter the way she ate. It did not happen over night and she fought it for a long time. Diabetes hits closer to home for me now. My Mom is young. She is 65 and must make some changes in her diet and with her weight. She has, for years, filled her meals with bad carbs, sugar, soda pop, candy and sweets. The over loading has caught up with her and now she is faced with some decisions. Change is hard, especially with food. I took my Mom to New York this past summer. I don't live by my Mom and so I was not fully aware of how close to a diagnosis of the disease my Mom was until we were in the financial district. Between high rises and busy traffic streets I turn to find that she is shaking, turning white and on the verge of passing out. Her sugar had dropped. She has hypoglycemia. Hypoglycemia is an indicator of a health problem. In my sister and I 's mind we already knew what the health problem was and I am pretty sure my Mom did too. Having dealt with similar issues myself, I understood what we needed to do. We found a cool place for her to sit and I went and bought several snacks that she could eat. With in minutes she started to feel better. It took her 30 minutes to feel well enough for us to continue our visit to the city. I was worried. This scared me. I saw first hand what she had been dealing with for a few years. When we returned to my home in Maryland we tried to understand what she needed to do next. The writing was on the wall for us. I bought her snacks to carry with her at all times and we learned that she needed to eat more frequently. I was glad that I could monitor what she was eating and together we could help her understand the healthier diet that she would need to consume. I had 8 more days before she left my house and I wanted her to see that, if done right, she could feel better. We talked about her going straight home and making the call to get checked for diabetes. I was worried. I was seeing her future. I was seeing my kids without a grandmother. I was being selfish because I wanted her to be healthy. I wanted her to buy the kit to check her blood. To stay on top of how she was feeling. I wanted her to talk to a nutritionist to help her with her diet. I wanted her to stop eating crap food. I wanted to scream…CHANGE DAMN IT! Please, change so you will be around longer and not die. I know enough about diabetes to understand that you can live a full life if treated properly and the right steps are taken to find balance in your diet. My comment above is iterated with a level of frustration. I know my Mom and her situation and so I do worry. She has struggled for years to get the weight off, she is a stress eater (usually sweets) and she enjoys sweets. Change is needed, but will it happen? I can't make my Mom eat the right foods if she does not want to. She must make the change not me. It's hard being a family member and watching someone deal with diabetes and the onset of diabetes when they are not willing to accept that they have or could have it. She did go home and had the test done. She was counseled that she was border line diabetic and that changes needed to be made. A few months later she started a treatment of medicines. In writing this I understand that the only person I can influence and change 100% is me. It starts with each of us. We must listen to our bodies. We need to stop pretending that fast food restaurants, processed food and that exercising is not vital to our health. I believe it is. We must become aware and do something. I made the change. I stopped eating wheat, I don't eat processed food on a regular basis, I exercise so I don't allow myself to get over weight. I have experienced several episodes where my sugar dropped and that was all it took. I felt awful during those times. I knew immediately when I started feeling this way what my future would look like, I had watched my Mom and Grandma go through similar episodes and I refused to take that road. If my genes dictate it, I still could get diabetes, but I am trying to do everything I can with my diet to prevent this from happening. It took three generations in my family for someone to finally say enough was enough. I will not stop suggesting ways that my Mom can improve her diet. To encourage her to fight through the urges of eating junk food in place of whole foods. To exercise even if it is only 10-15 minutes a day. Changes can be made with help and support. The efforts of such organizations as the International Diabetes Federation and American Diabetes Association help bring education, research and support groups to all of those suffering and learning to live with diabetes or those issued with caution to change before a more serious action is required. The opinions expressed here in this post are mine, a daughter who is frustrated. I love my Mom with all my heart and I just want the best for her. My research into this disease has just begun. I hope to learn more through the other post that are being shared today. Awareness is a wonderful thing. If you have symptoms of diabetes or suspect that you might, go talk to your healthcare physicians. Try to stay on top of it or in front of the disease before it's too late. I believe early detection and monitoring is one of the keys to success. If you have been advised to cut back on sugar and carbs, then seek out a support group, do the research and make it a priority to get better and feel good again. I will say it again, change is hard. I know. Keep fighting and surround yourself and your family members with support, love and hope. This is an easy recipe with healthy ingredients. To make meatballs: Preheat oven to 375. Combine all of the meatball ingredients. Using a cookie scoop, scoop meatballs onto cookie sheet. 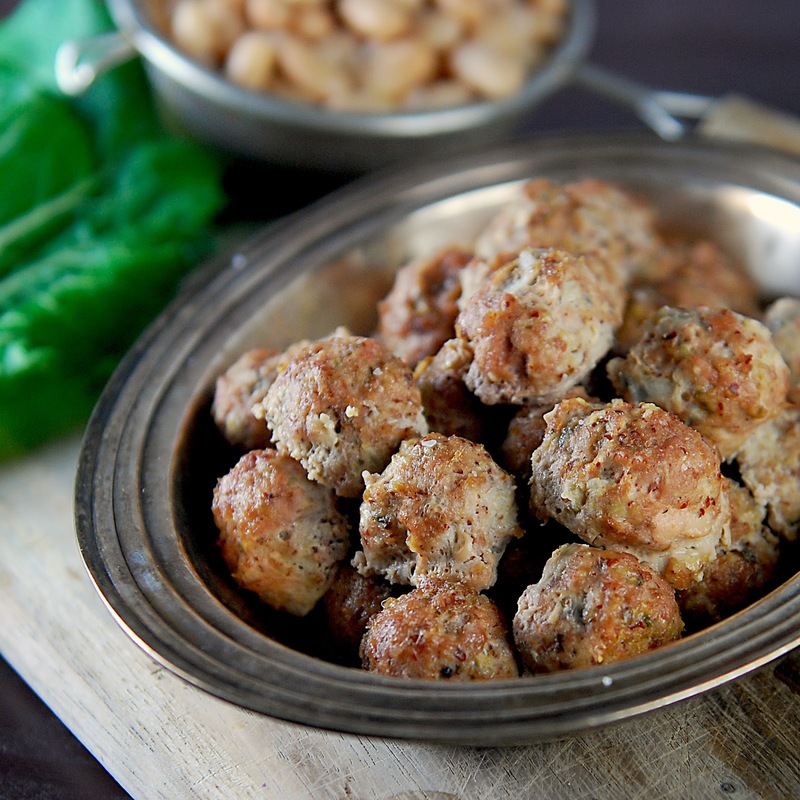 Bake for 12-15 minutes for small bite size meatballs. If you chose to make them larger you will need a longer bake time. To make soup: In a large pot add chicken broth, beans, onion, carrots and oregano. Bring to a boil. Let simmer for 6-8 minutes until carrots are soft. 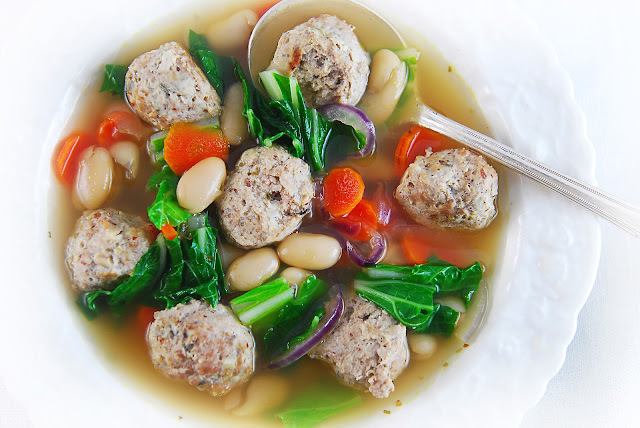 Add meatballs and your choice of greenery (bok choy, chard or spinach leaves). Cook for 5 minutes until greenery is wilted. 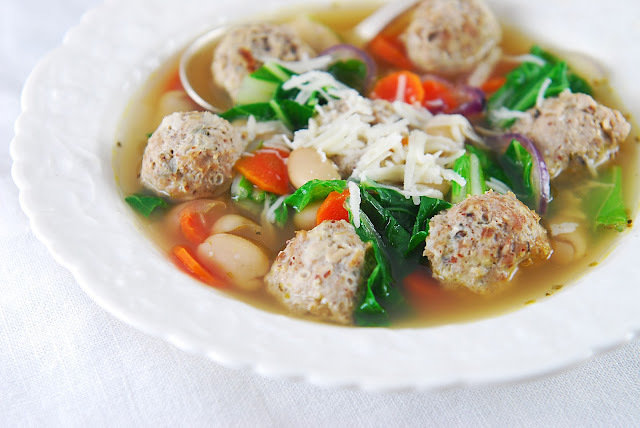 Serve soup garnished with Romano cheese. Change IS hard but with recipes out there like these it makes it not so bad. This looks great for Fall/Winter! 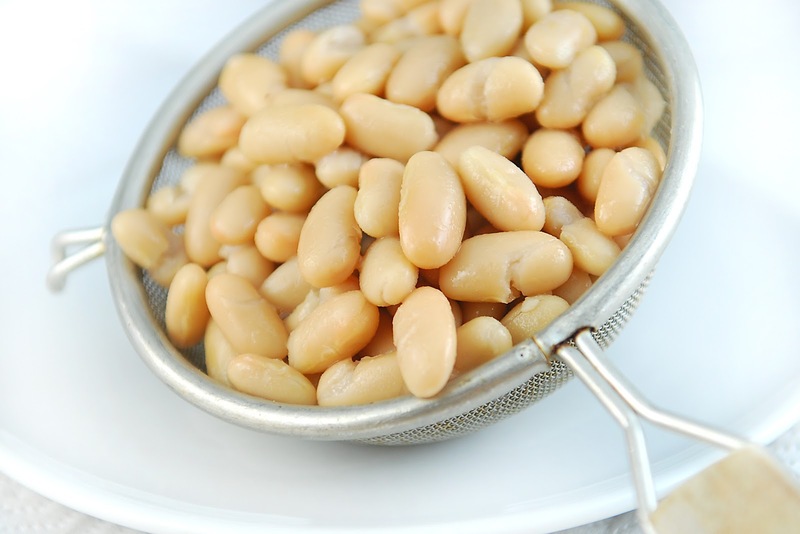 What is the carb count for a can of the Canellini beans? You are so right - change is hard, especially when it comes to food. I wish your mom the best of luck and I can't wait to try your soup! P.S. If you really want to learn more, I recommend this movie: http://www.youtube.com/watch?v=evcNPfZlrZs I'm not affiliated or anything, I just agree with what it has to say. It's funny, too. provide. It's awesome to come across a blog every once in a while that isn't the same out of date rehashed material. approximately my problem. You're amazing! Thank you!